Rahami was on Tuesday night charged by federal prosecutors with four counts, including the use of weapons of mass destruction and bombing a public place. Did Hans Blix know, all those years ago in Iraq, that he was supposed to be looking for pressure cookers? Would it have affected the result? Probably not. We can only hope that the Iranians are stuck at the bain-marie stage. 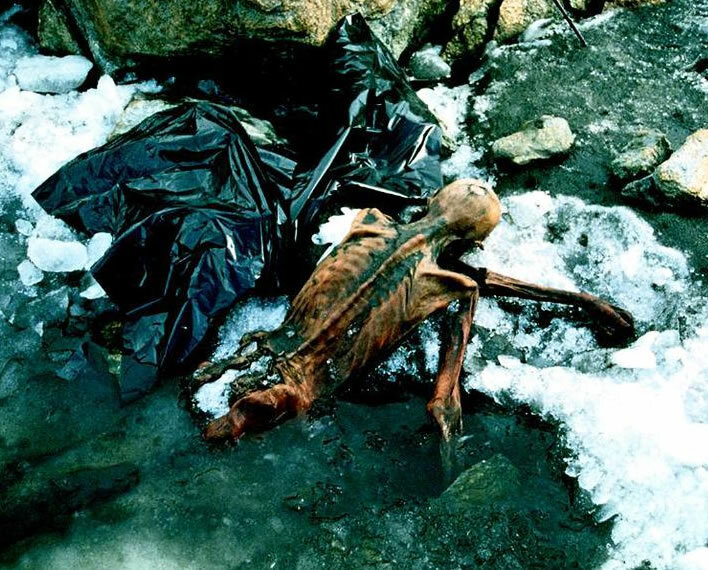 The mummy now christened 'Ötzi' was found 25 years ago today in a rock channel on the Tisenjoch, at an altitude of about 3,200 metres in the Ötztaler Alps, on the border between Austria and Italy. He is around 5,300 years old and is currently chillaxing in the specially built South Tyrol Museum of Archaeology in Bozen, Italy. Poor old Ötzi was hit in the back by an arrow. It appears to have been fired from about 20 to 25 metres away, possible from the shelter of a rock. The arrow penetrated his shoulder blade and cut an artery. He bled to death within a few minutes. He also had a head wound, which may have come from falling down unconcious onto rock. What was he doing there? Where was he going? Was he ambushed? Was he challenged and did he try to flee? After he collapsed his body was not moved, making robbery and trophy-taking unlikely – even his valuable axe was left on him. There are no marks of a fight or of other mutilations, so that it seems that he was simply killed. There are indications of an earlier wound on the hand. The shaft of the arrow that killed him has not (yet) been found. Did his killer pull it out? It seems a long way to come to settle a feud. Was there a falling-out? Did he represent competition for his killers? Even modern hunters in the Alps are very territorial. So much has been discovered about him, yet we really know so little about what went on that day 5,300 years ago. We on this blog are fond of a little simple xenophobia. It was a survival strategy in times of scarce resources, times that are characteristic of prehistoric life. Distrust of strangers brought only benefits. We should also remember that there were no maps. Frontiers were fuzzy conflict zones, unless there were clear geographical features such as rivers or, as here, a mountain saddle or ridge. 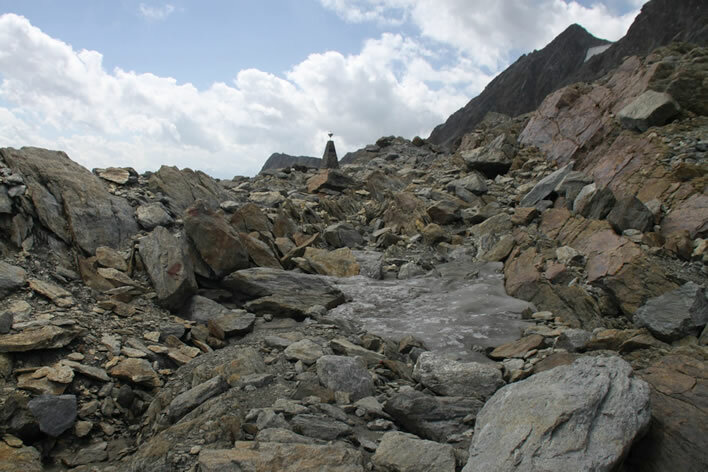 The war of words which broke out between Italy and Austria over the ownership of Ötzi may be a reflection of the sensitivity of this fuzzy border fifty-three centuries before. Helena Veysey, 42, bought a fresh pasty labelled as 'cheese and onion' flavour only to make the 'horrific' discovery that it actually contained meat once she bit into the snack. She bought the pasty with her boyfriend Royston Casanova, 45, at the company's Newport Road branch in the Welsh capital four weeks ago. Ms Veysey has branded the £10 voucher she was offered as compensation 'an insult'. She said: 'It's nowhere near good enough. Some confusion between vegetarianism and virginity here. The difference is that after spending tedious teenage years vainly trying to end the sequence of failure and rejection, a £10 voucher when it finally happened would have been very welcome, the icing on top of the cherry, if you will. In time for its first anniversary Figures of Speech has been spruced up a bit. The changes are minor: they mainly affect the layout of the month menus, making them compacter and easier for tableteers to use. You may have to force a refresh of the cache of your browser (F5). If you notice the changes, that's good. If you don't notice the changes, that's also good. Our resident boffin points us to some interesting research from Yale. [H/t Neue Zürcher Zeitung (German).] Executive summary: you should always listen to your Mum. She is always right. Colds are caused by a virus, fevers usually by bacteria. Whether you are infected by the one or the other, you usually lose your appetite. If we infect one group of mice with listeria bacteria, and another group with the influenza virus, the mice with the bacterial infection lose their appetite more than the flu virus sufferers. Why? If you take both groups of mice and pass a glucose solution into their stomachs eight hours after they have been infected, all the mice with the bacterial infection die, independently of how severe the infection was or how strong the immune response. In contrast, the mice with the flu virus infection survive and recover. Why? Because Nature and your Mum know best. When mammals fast, their bodies produce 'ketone bodies' that can deliver energy to that most important organ of all, the brain. The ketone bodies also neutralise the poisonous by-products in the nerve cells left over from the destruction of bacteria. Taking away the hunger with glucose stops the production of ketone bodies and thus leaves the nerve cells unprotected, in turn leading to fatal seizures and cramps. During viral infections, however, glucose plays a positive role by helping cells defend themselves against viruses. Food for thought for the medical profession, who put patients on glucose drips as a matter of routine, irrespective of whether the infection is viral or bacterial. In the case of the latter they may even be making things worse. They should have listened to your Mum. Oh, and there are plenty of suitable lawyers on the web these days. The mice and their relatives are already contacting theirs. 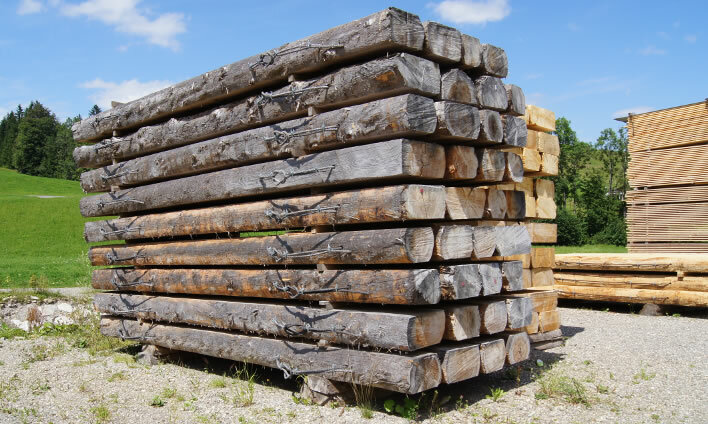 Puzzled a year long by these logs stacked at the local sawmill. Why are they in groups of four held together by wire cables? The solution is at the bottom of this page. 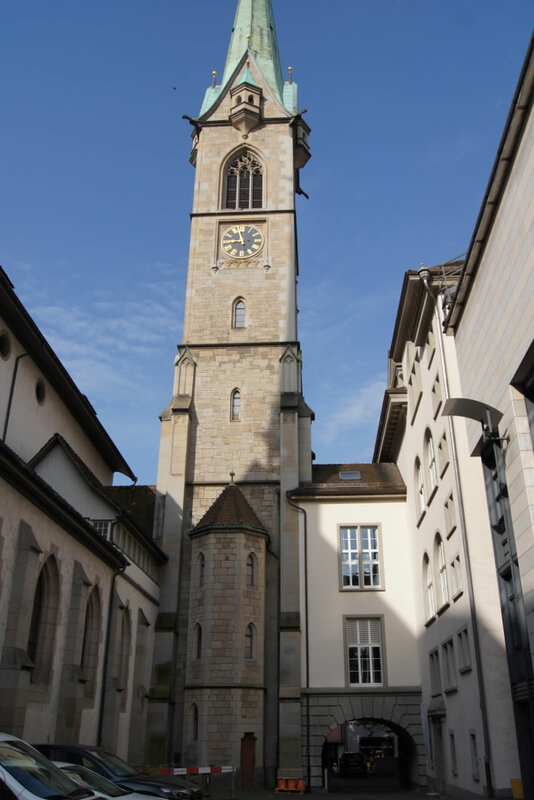 The Predigerkirche in Zähringerplatz in the centre of Zürich has been reconstructed repeatedly since it first came into existence in the beginning of the 13th century. In recent centuries the choir has been used for storage and as a library. In its latest manifestation it houses the music library of the neighbouring Zentralbibliothek. The last full renovation took place in the 1960s and the most recent internal reconstruction last year. The subtlety of the renovation is remarkable. Many of the old features can still be seen today. You can stare at this building for a long time, while you are drinking your coffee in the courtyard of the library. 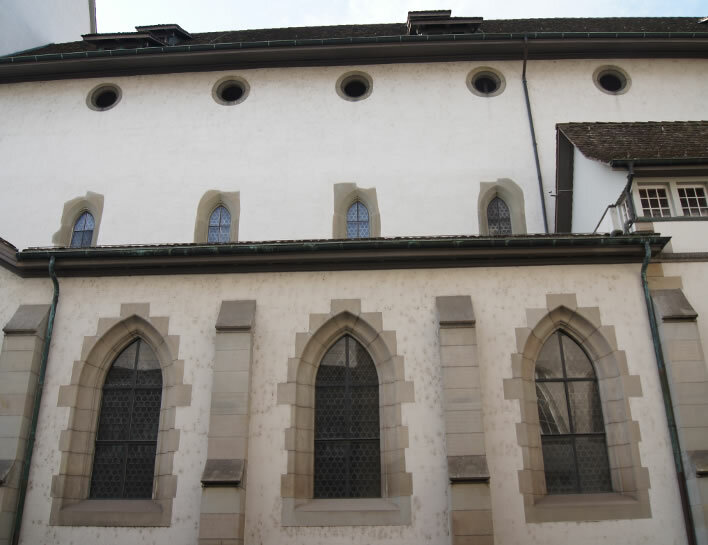 A view from the courtyard of the Zentralbibliothek of the side of the Predigerkirche. Note the pleasing irregularity of the middle storey windows. It requires confidence to do something like that in a restoration. 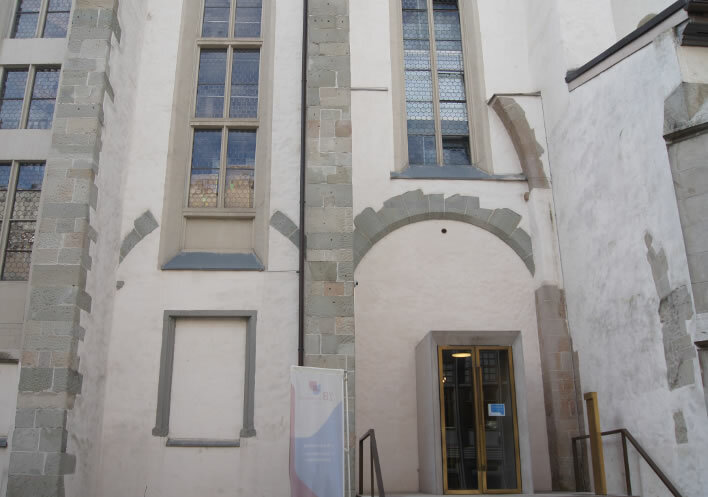 The entrance to the new Music Department of the library, now in the choir of the church. Everywhere irregularities and traces of the previous bones of the dinosaur. If you time your coffee drinking well you will hear a fine peal of bells on the hour from the clock tower. Now it is all perfectly clear. One in three parents admit to being so tired they skip pages or even 'RUSH READ' whole books for their kids … New research reveals a whopping 32 percent of parents admit skimming pages, while another one in three (31 percent) 'rush read' parts of or even entire books to their kids to enable them to crack on with household chores. Some of us gave up watching films years ago – with the exception, of course, of The Sound of Music (Nazis lose) and Where Eagles Dare (Nazis lose). The situations may be improbable, but both of these films make complete narrative sense at least. Most recent films or television dramas make no sense at all. There is hardly a scene in them with any logical or narrative connection with its neighbours. Scandi-noire stuff is incomprehensible. Thanks to this article it is now clear why this is. Children have listened to mangled stories and have grown up into people who no longer require any kind of narrative thread. Some of them have even become film directors. Miss out some holes in The Very Hungry Caterpillar and you are messing with the minds of a generation. A few days ago, some men in dark suits and some others with shaved heads or hipster knots arrived at Tim Blair's website at the Australian Daily Telegraph. Over the years he has done a wonderful job of keeping his visitors cheerful and sane. No more. The web designers and managers of online content had arrived. Every blog on the site had to follow a standard format: title, teaser paragraph, then anything else. The visitor is shown a list of titles and teaser paragraphs for all the recent postings, then has to click to open each each post for reading. (click, click, click –	geddit?). But this is not how Tim writes. He is renowned for his laconic, cut-to-the-bone style. His typical posting consists of one line, usually containing a link or two, then a short quotation, then a punchline. Sometimes the post is just one line with a link. He rarely posts content that contains a 'beneath the fold' section. At the cost of a little scrolling, the visitor gets a daily dose of extremely pointed humour. The layout on the page is part of its 'iconicity' as it is now called, its visual structure that is important in communicating the message of the medium. Tim's previous posts that have been migrated into the new system appear as a list of now meaningless titles followed by disconnected sentences. He will probably (have to) adapt to the new format. But his loyal visitors have to wave goodbye to their one-click daily fix of Blair humour. The avatar photo of the moderator who is fielding all the abuse and error reports from enraged fans is a man wearing a suit and tie, which in itself is humourous beyond verbal adornment. * Before you start shouting at your screen saying that this is exactly what Figures of Speech does – it isn't. Nearly all of the pieces in the month menu are too long just to be tacked one after the other in a single scroll. The scrapbook for each month is the place where we stack up short scrollable items (like this one). We don't have advertising or tracking, so clicks are only needed for the organization of content, not for the generation of revenue. The medium is indeed the message, Mr McLuhan, as you so perceptively noticed. A generous visitor – the sort we really, really like – brought us this back from a trip to Israel. Having found out how much it cost we have erected a small shrine to it in the corner of the wine cabinet. 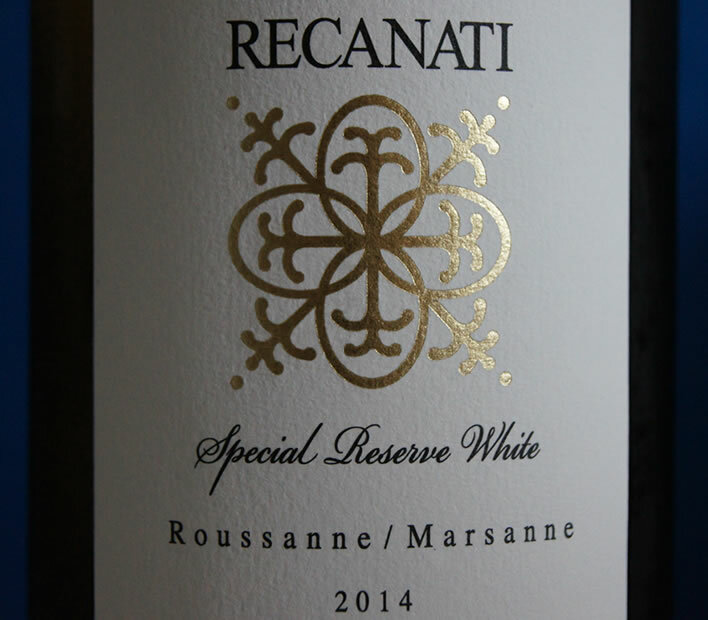 I had never heard of the grape varieties Roussanne/Marsanne before, so a trip to the drunkard's friend, Wikipedia, was called for. As one who studiously avoids French wine, even when someone else is paying, I was amused to read the following. In the 1980s, California winemaker Randall Grahm of Bonny Doon Vineyard smuggled cuttings of Roussanne that he reportedly got from a vineyard in Châteauneuf-du-Pape. Under California regulations, vines from outside the state are quarantined for a lengthy period which includes inspection for grape diseases and ampelographical identification at University of California, Davis. Grahm imported his cuttings in his suitcase and planted them at his vineyard in the Santa Cruz Mountains where he began making a Rhone style blend with Marsanne. In 1994, Grahm sold some of his Roussanne cuttings to Sonoma Grapevine, one of the largest nurseries in the state, who began to propagate the vines and sell them to wineries and other nurseries which spread these Roussanne vines across the state. One of the wineries that bought these cuttings was the California cult winery, Caymus Vineyards, who planted them in their Monterey vineyards. In 1998, John Alban of Alban Vineyards was visiting Caymus and noted that the Roussanne plantings looked more like Viognier than Roussanne. Samples were sent for DNA analysis and the result proved that the plantings were indeed Viognier as were all the vines that came from Grahm's original "Roussanne" vineyard. How else would you park your digger in a nice, tidy Swiss way?